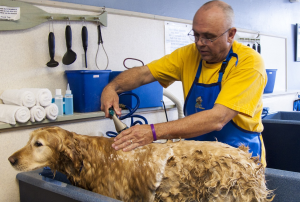 Does your dog require regular grooming? 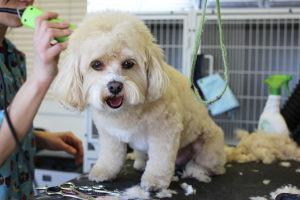 Going to the groomer can be a scary, stressful situation for your dog. The loud noises, strange sights, and new smells can be very stressful. Being placed in a strange environment or with new people may make your dog nervous or even aggressive. 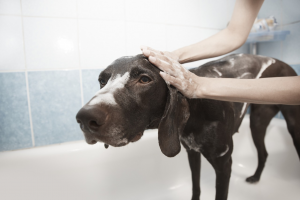 Here are some ways to make grooming go more smoothly, for both pet and groomer! Dogs often use body language as a way to show stress in a situation. 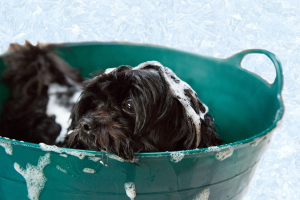 If your groomer alerts you that your dog is showing these signs, or you observe them yourself, your dog may need some extra help feeling comfortable. If your dog shows these signs of stress, he or she may need a little more time getting used to the groomer and handling. Getting your dog used to being handled is a great first step that can be taken at home. A dog that is easily handled will be less stressed at the groomer. This also translates to other locations, such as the vet, where your pet may need to be handled more as well. Start by offering your dog’s favorite treat whenever you work on handling and grooming. It can help to start this process in the evening or after activity, when your dog is tired and more accepting of touch. Gently squeeze their paw, play with their ears or tail, and then immediately give them a treat. If they’re afraid of objects such as a brush, this can also help. Hold up the object, turn it on to make noise, or move it without using it on your pet. Be sure to then offer several treats during this to help them associate the “scary” thing with something good! If at any time your pet becomes too stressed stop and try again later. You might have to hold the brush up for a few tries without using it before your dog is calm enough to accept brushing. Taking the time to make the experience positive instead of forcing them into a stressful situation will create positive experiences instead of scary ones. Your groomer can employ the same techniques there as you do at home. Let your groomer know if your dog is nervous when being groomed so they can take extra precaution to gently handle your dog. They can also be prepared to avoid being bitten or injured. Many groomers also have calming pheromone sprays on hand to reduce stress. Certain scents help pets relax, while playing soothing music can drown out stressful barking. Bringing a favorite toy or dog bed can make staying in the kennel more comfortable. If your dog still has trouble at the groomer, it’s time to ask for help from a local trainer. They can work one-on-one with you in a private setting to decrease discomfort and get your dog comfortable being handled. They can also observe in person your own techniques and make changes as needed to improve the experience. Grooming doesn’t have to be a stressful trip for your dog. With the above tips, you can make sure your dog has a fun time instead. 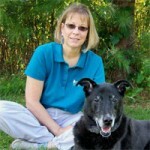 Leslie Wiesner is the founder of IT'S YOUR DOG School for Dogs located in Hamburg, New Jersey. She is a Certified Professional Dog Trainer thru the Certification Council for Professional Dog Trainers and an Associate Certified Animal Behavior Consultant thru the International Association of Animal Behavior Consultants. Read more about Leslie here. What’s the Difference Between Punishment and Reinforcement Training? Why Add Play Sessions to Your Dog’s Training?